I know I’ve mentioned this before, but we learn from repetition, so it’s important to share this from time to time. For those of you who trade intra-day timeframes as I do, it’s essential that you’re aware of the upcoming economic news releases or other fundamental events which can move your market. Let’s look at a couple of examples from last week which demonstrate just how powerful these moves can be. This first charts is the GBP/USD spot forex pair, 5 min chart, from Aug 6th 2009, at the time of the MPC Rate Statement and Official Bank Rate news release, in which the British Pound fell rapidly versus the US Dollar, after the Bank of England announced the expansion of its asset purchase program from 125 to 175 billion pounds. The first five minutes following the economic release produced a price range of approximately 120 pips. 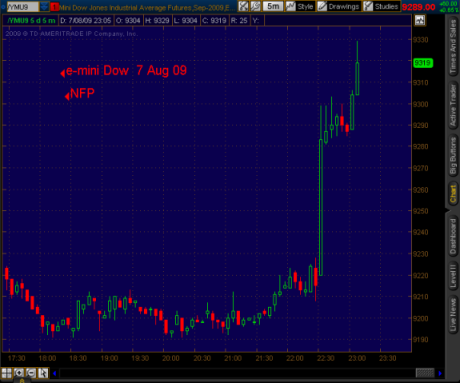 The very next day, Aug 7th 2009, brought one of the most-volatile events of the monthly calendar, the US Non-Farm Payroll (NFP). In this case the NFP beat analysts’ expectations with the payroll figure only declining by 247,000 rather than the expected 275,000. The following chart shows the impact again on GBP/USD, which oscillated over a range of 135 pips over the next 15 minutes. So, make sure you’re aware of the upcoming economic releases. There are numerous sources available. Most often your broker will provide this information. Take some time to consider how you will manage these events, whether by standing aside from the market, or perhaps just reducing position size. Of course, if you’re a longer term swing or position trader, your strategy may simply be in ensuring that your stop is beyond any anticipated volatility. How you manage these news releases is really for you to decide, based on what’s best for your strategy and your psychology. And no, for those new to forex who are excited by the massive moves, it’s not as simple as just bracketing the price action with buy and sell stop entry orders. Perhaps we can talk about that in future articles, along with other news release issues such as why the brokers spread suddenly widens dramatically – no, they’re not targeting you – there’s a real reason!